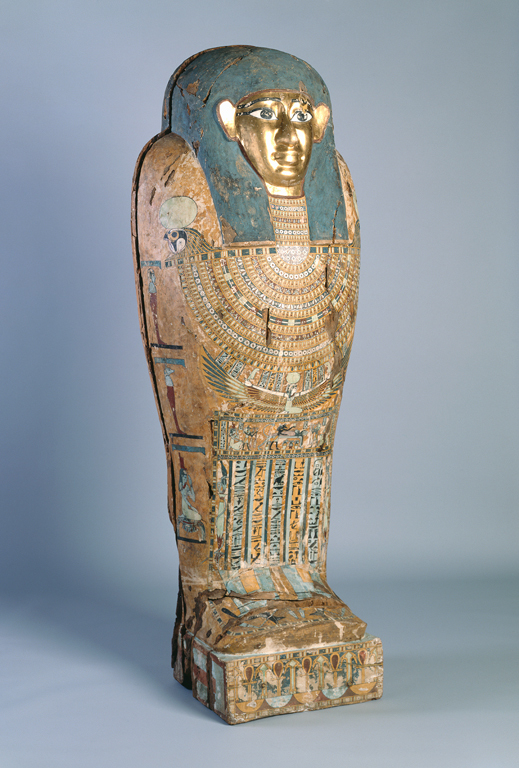 Aside from the pyramids, mummies and their coffins are the objects most associated with ancient Egypt. This anthropoid-shaped wood coffin is an excellent example of the artistic and religious practices in the late Dynastic and early Greco-Roman periods. Its beautifully painted ornaments and hieroglyphs invoke the gods to protect the deceased-a man named Pedusiri, whose mummy has not survived. His prepared body was probably enclosed in a cartonnage-a casing of plastered, painted, and varnished linen-before being placed in the coffin. The exterior decorations consist of an idealized gold face mask, a blue-painted head cloth, and an exquisite funerary collar with hawk-headed terminals that hold the strands of beads in place. The registers across the body depict the sky goddess Nut, with magnificent outspread wings, and a rare scene detailing the mummification process, attended by a ritual priest dressed as Anubis, the jackal-headed god of the afterlife. Below the embalming bed are canopic jars, which were used to house the viscera of the now deceased body; their lids are decorated with protective deities in the shape of a human, a falcon, a jackal, and a baboon. Kelly, Chelsea Emelie. People's Choice: Your Top 25 Works of Art in the Collection. Milwaukee Art Museum: Under the Wings, April 5, 2013. http://blog.mam.org/2013/04/05/peoples-choice-your-top-25-works-of-art-in-the-collection/. Andera, Margaret, Nonie Gadsden, Britt Salvesen, and Laurie Winters. Collection Guide: Milwaukee Art Museum. Milwaukee, Wisconsin: Milwaukee Art Museum, 2004, pp. 8 and 67, cat. 1, color illus. p. 8. Milwaukee Art Museum. Building a Masterpiece: Milwaukee Art Museum. New York: Hudson Hill Press, 2001, p. 47, color illus p. 18. Goldstein, Rosalie, ed. Guide to the Permanent Collection. Milwaukee, Wisconsin: Milwaukee Art Museum, 1986, p. 18, b/w illus. p. 18. Parke-Bernet, January 20, 1967 [auction catalogue]. New York: Parke-Bernet, 1967, cat. 108, b/w illus.